During the most recent Hui, there was a prolonged discussion on how to improve the Fever Zone for the upcoming season. While the zone is rocking when the Phoenix are winning, we’re sure most of you would admit it’s pretty flat when they aren’t. A couple of ideas raised on the night, and have been suggested in the past at various stages, were to introduce a megaphone and drum. There was a lot of discussion on how best this could be done. There was a consensus that having a capo down the bottom of the zone wouldn’t work for us. But we think we’ve come up with a system that could work. So as a trial, we’re going to give two things a go. 2) Someone in the middle of the zone with a megaphone to help support the traditional, organic chanting. This is different to a traditional capo. They will be there to follow chants, not lead them, when the zone is struggling for noise. We hope that this set up will help with the lulls that can happen and create a noisier zone. Hopefully with the abundance of Saturday night games and a strongest even squad (TM), this new set up won’t be needed. It may not work, but we think it’s worth a shot. We’re still thinking of how best to spread the word as the season draws closer. In particular how to reach zoners who aren’t on the forums or social media, so they aren’t too shocked by these changes. If you have any thoughts how best to implement this, or suggestions on who would be good candidates to take up these roles, please get in touch. 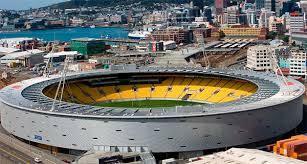 Either by posting here or sending us an email at info@yellowfever.co.nz. How about a smoke machine? It's only kind of a Zone thing, but the fire-mahujits they had at the Super Rugby final would be cool. But I bet FFA/RoF management may disagree. This is my special project. Working on it. I would be keen to do some drumming, though I don't have a drum yet. Hey fellas. Just want to say good on you for being proactive at looking at ways to add to the experience. 2ndBest and Tegal endorse this! The old tin cone megaphone would be a laugh to see. Have a watch of this video of the Timbers goal celebrations: https://youtu.be/SFBUNbJLHro?t=807. Trying to create a little bit of that here in Welly. Reckon the additional 15,000 additional spectators or so (ie a full house) probably has more to do the atmosphere. el grapadura and Bullion endorse this! or the performance on the pitch, which for the nix would often be a benefit. I'm willing to chip in for the drummers outfit! ConanTroutman and WhoStoleMySock endorse this! Hopefully we don't need it, but if we do I think it has a shot at working as long as everyone is on board. Speaking of which, how do we let people know? Flyers with a chant sheet at the first game? Ideally we'd reach people before that somehow though. As someone whose initial reaction was to be against the idea of drums, megaphones etc, I think the above strikes the right balance and will act as something of a trigger to the zone to say "we're quiet, let's lift our game". Worth a shot anyway. Am all for the drummer having an outfit! That'd be brilliant. Would the FFA think that it's a flare and ban it?